Get your mornings right with this warm bowl of good old-fashioned oats porridge with a sweet blueberry topping. The simple oats porridge recipe is vegan made with just water. As the weather starts to turn colder, I find myself more and more with a bowl of oats porridge for breakfast. 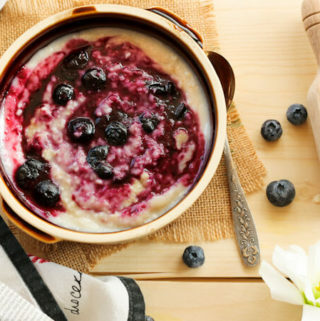 And the simple blueberry topping made with frozen blueberries adds a sweet and sour flavor and a fiery color to the plain porridge. Oats are rich in a soluble fiber called beta-glucan which helps lower cholesterol, keeps your heart healthy, and controls blood sugar levels. Oats are also rich in dietary fiber that helps to regulate bowel movements, improves digestion, and prevent constipation. 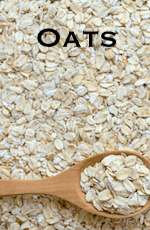 Oats are rich in vitamins, minerals, and antioxidants. They help lower blood pressure levels, and also have anti-inflammatory and anti-itching properties. Because the oats are whole grain, a bowl of porridge in the morning keeps you full for longer and helps control that mid-morning snacking. Thus helping in weight management. To make porridge, I normally use either old-old-fashioned rolled oats or the quick rolled oats as they are faster to cook than other varieties of oats, retain the nutritional value, and produce a thick, creamy texture when cooked. I love the cooking process of it as well, it is almost like meditation to stir the oats until they turn into this beautiful, perfectly non-lumpy porridge. It is no surprise that I learnt how to make oats porridge during a Vipassana retreat. I had told the organizers initially that I cannot take regular milk and if it would be possible to have a non-dairy milk option for breakfast. Since the oats porridge was cooked only with water, it was perfect. Also, the place where we had the retreat was in the mountains and it used to be chilly in the mornings, the oats porridge nourished us not only with its nutrition but also its warmth. Porridge is like the poor man’s breakfast — found across all cuisines and cultures. It is also one of the easiest cereals to make but it is also easy to mess it up. So often you will find this thick lumpy blob of oatmeal in the name of porridge. I love my oats porridge to be creamy and smooth. And to think that they are cooked only in water and no milk was a big reveal for me. to keep stirring them at low heat and let the porridge take its time. There is no point rushing the cooking. If you like this recipe, please take a moment to rate it and/or leave your comments at the end of the blog. It will really encourage me to keep exploring, learning and improving. 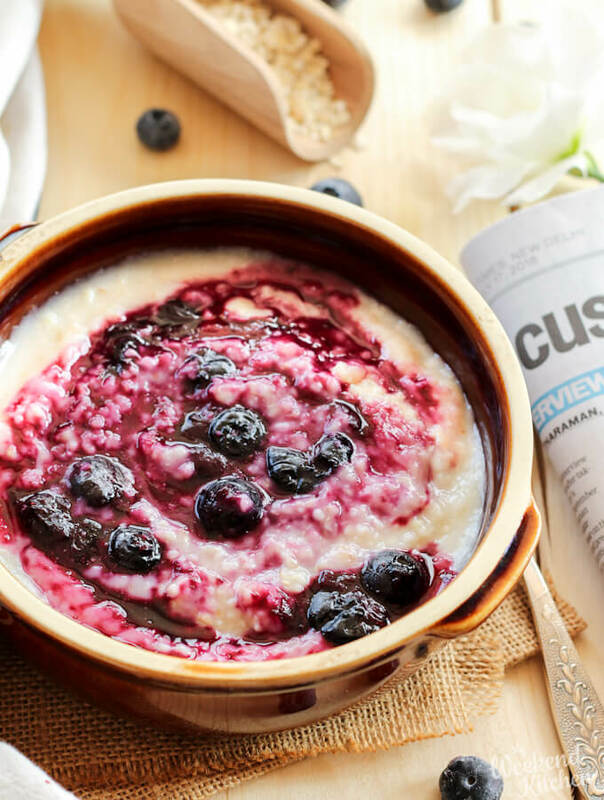 Get your mornings right with this warm bowl of good old-fashioned oats porridge with a sweet blueberry topping. The simple oats porridge is made without milk and only using water. 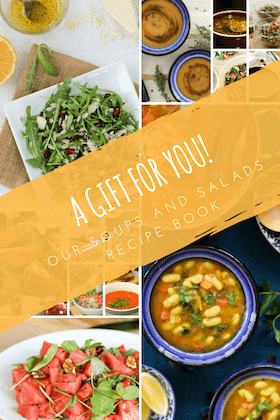 It is delicious, healthy, vegan, and gluten-free. Place a high wall pot (The porridge needs room to cook!) on medium heat. Start with adding the oats, water, and salt. Mix well with the back of a wooden spoon. Cover till there is a boil. Reduce the heat to low and continuously stir the porridge for about 6-7 minutes till it becomes creamy. It will be thick, with all the oats broken and you will see air bubbles popping out. * Remove from heat and empty in a bowl. Prepare the blueberry topping by steeping the frozen berries with 1 tbsp sugar and 2 tbsps water. Heat on stove for just a minute and mush with the back of a wooden spoon to release the juices and still have bits of the beauties. Make a small well in the porridge and pour in the beautiful blueberry topping in between. *If you find the porridge too thick, you can add a little non-dairy milk towards the end of cooking to loosen it a little. Oats are naturally gluten-free but since many farms grow both wheat and oats crop, cross-contamination may occur from the wheat crop. For gluten-free porridge, it is best to buy certified gluten-free oats which are not grown close to wheat crops. Awesome delicious oats porridge recipe. Looks delicious! Thanks for the same !! Simple, yet so filling and delicious, especially with those blueberries!! Yummy! A healthy and delicious breakfast. I love the colour the blueberry imparted to the porridge. I too love the striking color of the blueberries against the simple porridge! A nice twist to the simple oats porridge..Looks awesome!